Rob Carrey, the son of a working-class cabinet maker, arrives at the Fenton School with a scholarship to row and a chip on his shoulder. Generations of austere Fenton men have led the rowing team, known as the God Four, to countless victories but none are as important or renowned as the annual Tuesday-afternoon race against their rival, Warwick. But first Rob must complete months of preparation driven by their captain, Connor Payne's vicious competitive nature. As the race nears, the stakes rise, tempers and lusts are fueled, and no one can prevent the horrible tragedy that befalls one of them. Fifteen years later, Rob returns home from a film shoot in Africa to end a heartbreaking relationship with his girlfriend, Carolyn. But when a phone call from one of the God Four compels him to attend the reunion at Fenton, no part of Rob's past remains sequestered for long and nothing about his future is certain. 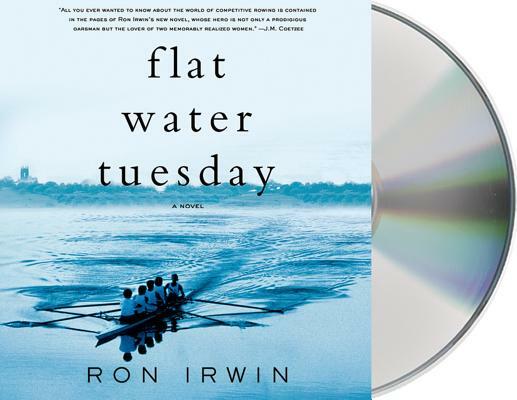 As much about the sport of rowing as it is a novel of finding oneself, not once, but again in mid-life; Ron Irwin's "Flat Water Tuesday" is a testament to the pride and passion of youth, and an ode to the journey of forgiveness. A stunning novel of boarding school, family secrets, deep and passionate love, and the brutal pain of sports training. RON IRWIN was born and raised in Buffalo, New York, and attended boarding school and college in New England, where he was a member of a number of winning rowing crews. He is currently the writer in residence for the University of Cape Town's MA in Creative Writing program, where he has taught since 1999. Irwin holds a Masters in Literary Studies and a Masters in Creative Writing, and has worked as a freelance documentary filmmaker and journalist. He is married and has three children. HOLTER GRAHAM, winner of AudioFile's 2008 Best Voice in Science Fiction & Fantasy for Sherrilyn Kenyon's Acheron, is a stage, television, and screen actor. He has recorded numerous audiobooks, including much of Sherrilyn Kenyon's bestselling Dark-Hunter series. The winner of multiple AudioFile Earphones Awards, he has also read works by Scott Turow, Dean Koontz, C. J. Box, and Stephen Frey.